Is all cow milk created equal? The Jersey Cow. Jersey Island is one of the channel islands and is eleven miles long and about nine wide. Its area is 36,680 acres of which 25,000 are tillable. The population is about 60,000. The island rises from the level of the ocean on the south in a long gradual slope to the north side, which has cliffs about 200 feet high along the ocean. the climate is mild and even, grass remains green throughout the year and is rather fine and nutritious. 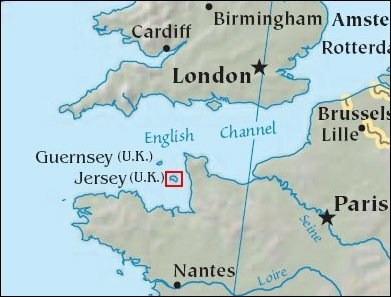 In 1789 the States of Jersey passed a stringent law prohibiting the importation of cattle from France. Since the law was passed, the Jersey breed of cattle has been kept pure since. Jerseys have been bred and improved with special reference to butter production for over 100 years. The valuable dairy properties of the Jersey were becoming better recognized making the breed become more popular and the English Jersey Cattle Society was established in 1878 with the first volume of the English Jersey Herd Book published the next year. A scale of points was made out for both cows and bulls and prizes offered at cattle competitions for the animals conforming nearest to the total possible amount of points awarded. Since the point scale had been created and as the English Jersey Cattle Society membership increased, a general improvement in the quality of the herds of the country took place and show entries became more numerous and the breed as a whole began to improve more rapidly from that time on. At the present time the cattle on the island are very uniform lot, but their average production is probably lower than that of equally good representatives of the breed in America, largely because they are fed a less liberal ration, especially of grain. In 1850 several Jersey cows were imported to Hartford, Conn., and in 1868 S.S. Stephens of Montreal, Canada imported nine animals, from which have descended some of the most famous producers in the Jersey breed. Over the next twenty years, many Jerseys would make the journey across the Atlantic. In North America, cows of the St. Lambert breeding brought enormous prices. A single cow of this breed could fetch a price as high as $25,000. Twenty-five animals each of the Jersey, Guernsey, and Shorthorn breeds competed in a dairy test at the World’s Fair, Chicago in 1893. The Jersey won first place on total production in both categories of cheese and butter. After its success at the World’s Fair, the breed’s popularity grew and their numbers increased very rapidly in the following years. The U.S. still holds cattle competitions for milk production and aesthetics at the U.S. Jersey Cattle Association Jersey Jug Futurity contest. An image of the winners here. WHY ARE JERSEYS SO SPECIAL? The Jersey breed is known for high overall solids – fat and protein – to water ratio in its milk as compared to other cow breeds. In the composition of the milk solids, the Jersey produces more fat relative to the amount of protein in its milk. Milk rich in fat (compared with milk poor in fat), usually produces cheese containing more fat in proportion to other constituents. It has been observed that Jersey milk performs better in cheesemaking provided the process of cheese-making is performed in a normal manner, so as to avoid excessive loss of fat or casein. The composition of cheese depends primarily upon the composition of the milk used. Although the Jersey breed has the highest percentage of milk fat, the percentage of milkfat varies greatly throughout the population of the herd as compared to Holsteins. Skimmed milk is simply the skimming, or removal of fat from milk. This reduces the amount of fat in relation to casein, because, in skimming milk, only a relatively small amount of casein is removed with the fat. The remaining skim-milk is therefore richer in casein relative to fat. The converse is also possible. 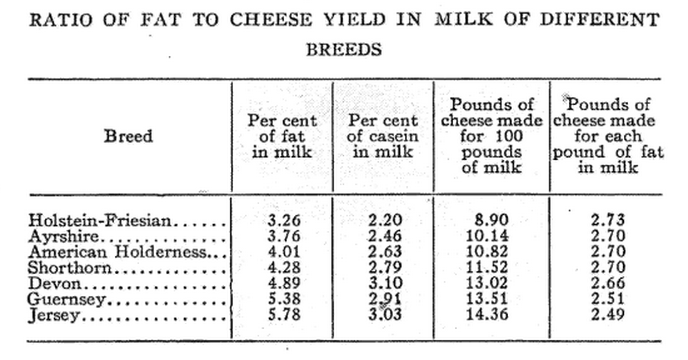 For example, how much fat would it be necessary to add to the Holstein-Friesian milk to have it make cheese like that made from Jersey milk? Calculation shows that nearly one pound of fat would need to be added to 100 pounds of the Holstein milk. While many conditions cause the percentage of fat in milk to vary, only three naturally occuring conditions are of special importance with cheese-making: (1) Breed, (2) stage of lactation, and (3) change of diet and activity from barn to pasture. Cheesemaking is the process of concentrating milk fat and protein by separation from water and soluble components. The objective of the cheese maker is to maximize yield efficiency by optimum utilization of each milk component while not compromising cheese quality. 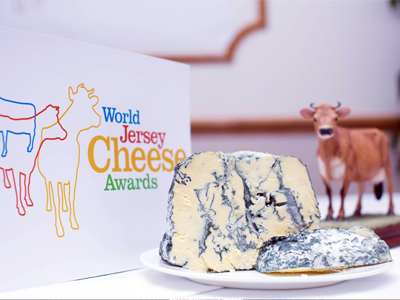 The overall winner of the World’s Best Jersey Cheese Composition, 2012 was Willi Schmid for his cheese Jersey Blue. While many people love all-Jersey milk cheese for its creamy texture and rich flavor, a lot of other farmers opt for a mixed-breed herd. Or, as in the case of Vermont Ayr, made exclusively from Ayrshire cows. Explore the taste of Jersey cow milk cheeses at your local cheese shop and if the breed isn’t displayed, ask your cheesemonger! Categories: Breed | Tags: award, England, Jersey, scale | Permalink. Neal’s Yard Dairy is a world renowned cheese shop in London that buys cheese from about seventy cheesemakers on farms around Britain and Ireland and sells the cheese in our two shops in London and to shops and restaurants all over the world. Many cheeses that are received are aged by Neal’s Yard Dairy staff in maturing rooms in Bermondsey which are in brick railway arches under the main line from London Bridge to Dover. This video, created by Neal’s Yard Dairy is an excellent documentation of the cheesemaking process beginning with the animals and terroir and ending with the delivery of cheese to the consumer. It is really awe inspiring to me to see so much of the work being done by hand. Categories: Cheese 101 | Tags: cheesemaking, making cheese, Neal's Yard Dairy, process | Permalink.